Special discounts available for May only for anyone within 15 miles of our HQ at BA11 – 10% discount on thermal blinds in standard fabric (9 colours available) if you order 2 or more. ALSO there is a 5% discount available for all orders of four blinds or more, wherever you are. Email your sizes and a photo and we will send you a price & swatches. A lovely new patterned & textured fabric range is now available. We have spent weeks testing to ensure that the fabric is suitable for our five layers & now bring you the ‘Classic’ range. There are 39 different fabrics to choose from. Download a pdf showing the range here. Email us with your window details (photo & size) to info@thermalblind.co.uk & we will send swatches. We exhibited at the Regen SW RE Marketplace on 8th April at Westpoint, Exeter – stand Sh 15 in the ‘Community’ section (by the catering stall!). Download a leaflet here. We launched the new fabric range, well received! The Exhibition: Featuring over 100 south west companies including, renewable energy installers; construction companies; training providers; manufacturers, consultants and advisors; energy assessors; financiers and banks and installers of energy efficiency measures. You should be able to meet everyone you need for a project here under one roof. Outside: A showcase of green cars (including test drives), charging points and smart energy solutions. Demos: In the middle of the exhibition hall there will be a number of demos. The Talks: We have lots of talks on the different renewable energy and energy efficiency options for you. These include individual technology overviews, updates on policies and funding streams. Specialist talks for farmers, communities and the arts sector. The Conference: A high level overview of the sector. Designed for those who are already developing projects or those looking to explore complex policy areas or opportunities. The show really is the place in the south west where anyone with an interest in renewable energy, energy efficiency and sustainability all meet up. We look forward to seeing you there so please drop by our stand and say hi & please bring a friend with you! Child safety is important to us. With recent new legislation (February 2014) our blinds now have additional safety features to ensure that there is no choking or strangulation hazard to children. There are two modifications which will be made on all blinds from 28th February 2014. 1. The chain loops supplied to control the blinds will be supplied so they hang no lower than 1500mm off the floor and included will be appropriate safety cleats for you to fix the bottom of the chain loop. These have been supplied with the blinds for some time now but it is now compulsory for the customer to fit them on installation. 2. The cords on the back of the blind will either be supplied at spacings which do not need safety devices OR we will supply the blind complete with safety release catches designed so that the cord separates under a load of 6kg. These features ensure that the blinds comply with the new British Standard BS EN 13120. For more details see our suppliers information page. We offer a retrofit scheme for older blinds for our existing customers. Contact katy@thermalblind.co.uk if you have any concerns or would like to have your blinds modified. We advise all previous customers to ensure they have fitted the safety catches provided. If existing blinds are accessible by young children please consider using our retrofit service. You can download the British Blind & Shutter Association’s ‘Make it Safe’ brochure here or see the ‘Make it Safe’ website. We fully support the BBSA’s (British Blind and Shutter Association) ‘make it safe’ campaign. We will supply and install safety devices or offer alternative operating methods where children or vulnerable people may be present. EN 13120 – Internal Blinds Performance requirements including Safety. Useful information from Hunter Douglas. Please note we can supply retrofit safety devices as well – don’t take a chance, make it safe! How to do it – for a sash window. The blinds were designed specifically for sash windows, though they work on other windows (see this post). Here is a drawing showing how they fit & which dimensions we need. You can download the instructions as a pdf (includes photos) here and if you’d like a Word version of the dimension chart to fill in it is available here. How to do it for a non-sash window. Often the blinds are fitted in the recess of a window reveal. Because the headrail is 44mm deep it is usually fitted in front of the existing frame, fixed either up into the soffit or into the window frame (see below). We will need the exact measurements of the width & height of your recess, together with photos showing each corner of the window (without curtains or blinds), plus the floor to sill height. Download instructions (pdf) here, or a Word version here. The blind will be made about 8mm narrower than the recess so it doesn’t rub on the walls. We will be exhibiting, as usual, at this lovely Show on 16th & 17th November. It is held at the Royal Bath & West Showground (near Shepton Mallet). For free tickets click below. We will be on stand 216, right in the middle of the main hall. Come & see the blinds in action, pick up a sample or discuss your problem windows with us. If you remember to bring a photo that’s even better! You can see our previous show stands here for 2012 & 2011. I was greatly honoured to receive the People and Environment Achievement Award for the Best Energy Saving idea in 2012. See the website here. A glittering & fun ceremony was held and announcements made by Michaela Strachan & Jarvis Smith. Two Shows this month we are attending, first in Camden on 21st March, the greenerHOMEevent run by Camden Council from 3pm – 9pm then at Green Park Station in Bath the Green Living Fair from 10am to 4pm. Come and have a chat, pick up some samples or get a guide price. Both events have some brilliant talks, demos & lots to see. As October drew to a close the emails picked up & it took a potential customer to explain why. “I expect you’ve been busy since the Sunday Times article?”, they suggested. Erm…. well it rather passed me by to be truthful! But the evidence was there to see, the website hits shot up so it was time to check it out. I have no idea how she heard about the thermal blinds but Julia Kendell (DIY SOS) wrote about them in October 2011 here & it appears that the paper likes to look at preparing your home for winter each autumn, so there it was, another reference in a national paper, how fabulous! 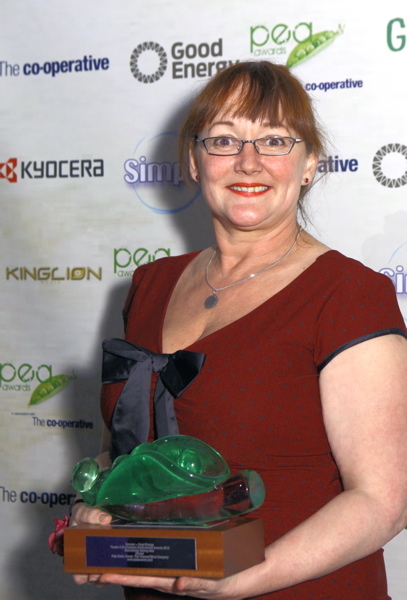 Journalist Lucy Denyer wrote the piece entitled “Top insulating tips. 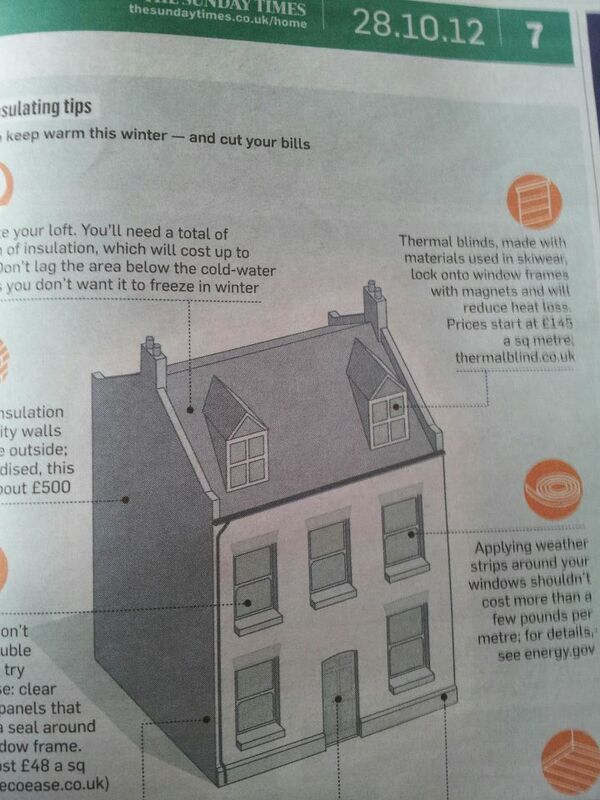 How to keep warm this winter – and cut your bills“. Our thermal blinds were one of ten ideas suggested.